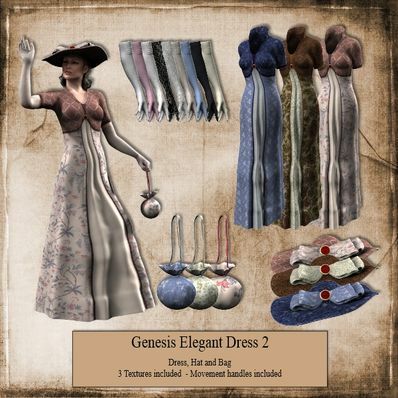 Dress, Hat, Bag and Long Gloves. Movement Handles included. Oh my! What a lovely outfit, and the gorgeous accessories, the bag, the lovely gloves, and awesome hat, the great textures, thank you! Thanks again! It will help me a lot for my art studies. Thank you for your generosity in letting us download your designs, these were just what i was looking for. But I'm sure that won't stop me maybe downloading lots more. Thank you so much. Love the long gloves, hat and bag along with the gown. Beautiful, TKU!